This entry was tagged Andalucía, East of Malaga, Europe, Frigiliana, Malaga, photography, Spain, travel, Travel theme, white villages. Bookmark the permalink. Marianne, I love your blog! I do subscribe but only ever seem to catch the odd one in my reader. Hmmm I know that happens to blogs I love, too. I wonder why that is, Jo? Those lizards look like the little lizard friend who hangs out in my flat in Oman, except he is not nearly so colorful. I love this photo!! Now that’s the way to display your wares. Must have been something to see, the wall and figures, at once. Any one of them would make the perfect souvenir. wallhangings are bound to put a smile on anyones face. 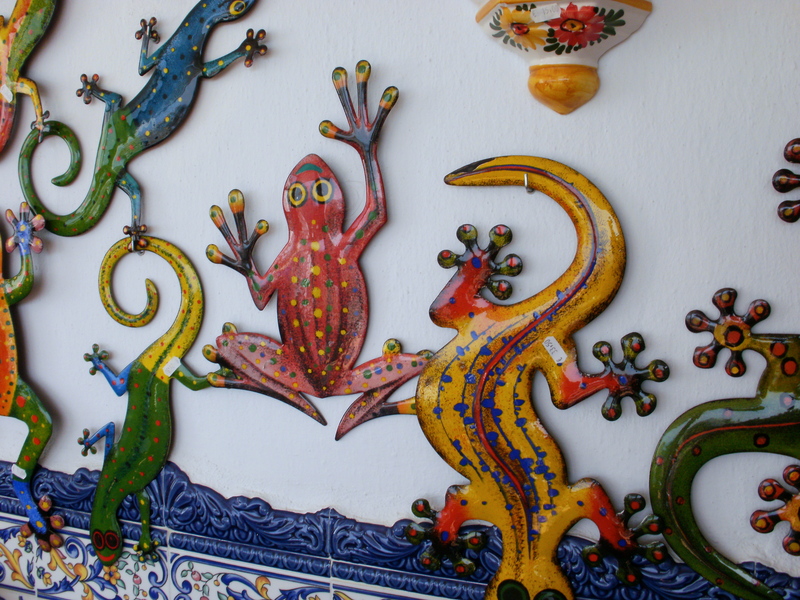 They’re gorgeous aren’t they – I have a pal who bought a few in Frigiliana on her last visit! Soooo lovely! I’ve never been to Frigiliana, sure love to get out there someday. Friends of mine here in Kati have some similar ones…I love them…and these. Beautiful tile work for the wall. Thank you for the post! Happy travel, Marianne! Hi Amy – yes, the tiles are stunning. I’ve seen those (or similar) and always wondered where I’d put one. Now I know I’d need about seven of them and they should cover one entire wall. Brilliant. They are, aren’t they? Thanks Sylvia. fantastic picture but Mrs Sensible would have a heart attack. She is terrified of Geckos even pictures of them. You’re living in a colourful country! Oh yes, Trish – Spanish is colourful in many ways! I like those – I think I’ll get one when I visit Spain this year! Are you coming east of Máalaga, Andrew? It’s a part of the country that I have not visited. I am reading Gerald Brenan – South from Granada so would like to go to the Alpujarras and I need to see Granada. This year I am going to Siguenza, Asturias and Catalunya! The Alpujarras are delightful 🙂 But if you decide to go south from Granada (a bit further) and turn west when you reach the sea, you will soon be in my neck of the woods. Give me a shout if you want to meet up (and if I’m not gadding about somewhere). Glad you enjoyed it, Ioanna.